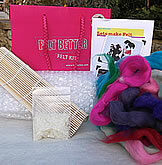 This kit has everything to get create your own work of needle felted art. This kit has everything to get started on a fascinating craft, needle felting art. The kit contains full instructions, needle felting foam block,two felting needles: a triangular 36 gauge felting needle for general work and a 38 gauge star felting needle for fine work and detailing, also a good selection of coloured wool fibres perfect for creating beautiful felted pictures. 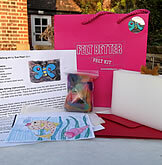 This is the perfect kit for a special friend, teenager or a gift to yourself.